On April 27, 2012, Bryce Harper was called up to the major leagues by the Washington Nationals. The national fanfare surrounding his promotion lasted barely a day before fellow phenom Mike Trout stole the spotlight by also making it to the “bigs.” Harper went on to win the National League Rookie of the Year in a relatively close vote, while Trout won the American League Rookie of the Year unanimously and nearly won the AL MVP. 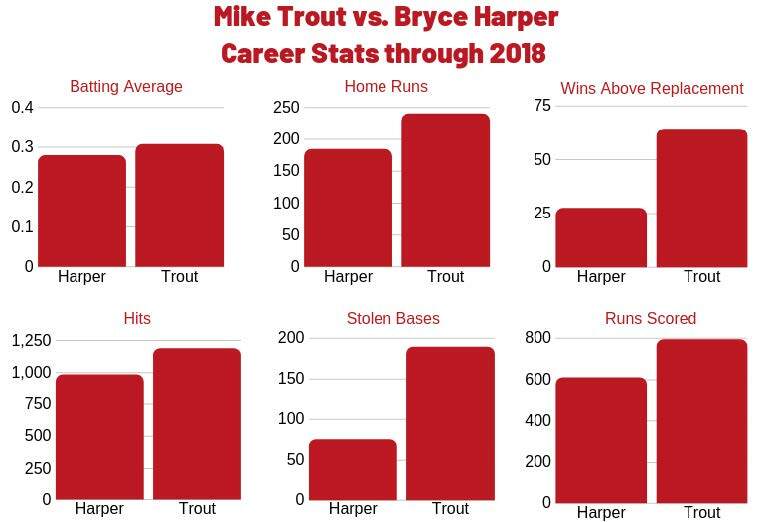 Every time Harper appeared to have surged in front of his West Coast rival, Trout continually asserted himself as the better player. It’s therefore all too appropriate that less than a month after Harper inked the biggest contract in baseball — 13 years for $330 million — Trout would overshadow him by committing to the biggest extension in the history of sports, extending his contract with the Los Angeles Angels for 12 years at $430 million. Just as the MLB was commending the former for being the richest man in the game, the latter had to send shockwaves throughout the sports landscape by signing a deal that trumps Harper’s by over $100 million. Harper, who had openly admitted that he would be trying to recruit Trout to the Philadelphia Phillies when the time came, is now once again brushed aside as the inferior superstar to baseball’s one true MVP. Few would argue that the contract isn’t well-deserved. Since his debut, Trout has hit for a .307 average, with 240 home runs and 189 stolen bases to his credit as well. His career wins above replacement of 64.3 is the highest of any player at his age. He has made the All-Star team every year of his career, won the AL MVP twice and finished in second four times. If the 27-year-old called it quits today, it’s likely that he would make the Hall of Fame and be considered one of the best players of the 2000s. If he can continue with this level of production for years to come, Trout could potentially retire as one of the best to ever play the game. While Trout will surely continue to rack up personal milestones during his career, it remains to be seen if his impact will ever be felt in October. The superb outfielder has never won a playoff game in his career. In fact, his team has only played in three over the course of his seven seasons in the majors. Despite bringing in big names like Josh Hamilton, Albert Pujols and Shohei Ohtani, the Angels haven’t been able to find a way to get to the playoffs consistently. Their brief appearance in 2014 resulted in a tidy sweep at the hands of the Kansas City Royals. They haven’t been able to get back to the postseason since. It looks likely that Harper’s Phillies will soon blossom into a contender in the NL, but things don’t look as optimistic for Trout’s team. Following yet another sub .500 season, Los Angeles hasn’t made enough changes to catapult them to the top of their strong division. The Seattle Mariners are expected to take a step back after trading away much of their top talent this offseason, but the powerhouse Houston Astros and pesky Oakland A’s still stand in the Angels’ path to the postseason. If the Angels don’t make some serious improvements to their team, it’s likely that Trout will have a career arc similar to that of all-time great Ted Williams: numerous accolades and universal acclaim, but noticeably ring-less fingers. Almost all players would love to be compared to Williams, but Trout will surely want to at least compete for a World Series sometime soon. It’s worth noting that the extension he signed has no opt-outs, meaning the future Hall of Famer could be stuck in baseball purgatory for the next decade with no escape in sight. That being said, 12 years is a long time. The Angels don’t have to get good immediately. Reigning Rookie of the Year Ohtani seems to show a lot of promise on both sides of the diamond, while the Angels’ farm system shows signs of promise. A few years from now, the Angels could theoretically be the best team in the league. Trout’s mega deal is just the latest extension in an offseason that has been full of elite players electing to remain with their respective teams, as opposed to testing the waters in free agency over the coming seasons. Paul Goldschmidt, Nolan Arenado, Aaron Hicks, Blake Snell, Alex Bregman, Chris Sale and more have all committed to remaining with their teams for years to come. This is presumably correlated to this year’s slow offseason in which extremely talented players had to wait unusually deep into free agency in order to sign the contracts they wanted. Some superstars still haven’t even found a home, like former Cy Young winner Dallas Keuchel and All-Star closer Craig Kimbrel. All of the aforementioned players found it best to ensure their futures now, rather than risk it all on the open market. Other All-Stars, however, are still betting on themselves. Reigning AL MVP Mookie Betts has said that he will likely test free agency after the 2020 season. It remains to be seen over the coming months if fellow standouts like Aaron Judge agree with Betts’ philosophy or instead decide to take the more conservative approach. The free agent market may begin to weaken, but the trade market will always be intriguing. Even in the age of these enormous contracts, anyone can still be dealt at any time. Just ask Giancarlo Stanton, who was in the early years of a 13-year extension with the Miami Marlins before getting shipped to New York. Organizations change their minds all the time and cornerstones of the franchise are just as likely as anybody else to get traded when opportunity strikes. The Angels and Trout aren’t thinking about any of that, though. They have their eyes on the future. It’s unknown if the years to come will be generous to the oft-forgotten Los Angeles baseball team, but they have to feel pretty good now that the best player of this generation is under lock and key.